I know a young man who makes it a practice to arrive late in church every Sunday. I often wish that he did not go to church, for he makes me cordially despise him, thus disturbing the calm and quiet of the proper frame of mind for Sundays. I conclude that he likes to be looked at, though why he should do so is not apparent. It is, in fact, not only rude, but irreverent, to be late in church for the beginning of the service. 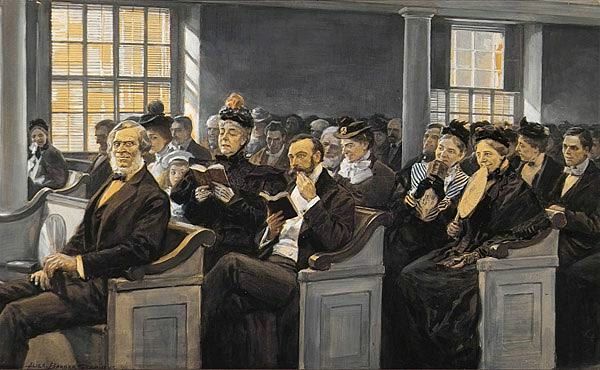 If one should be accidentally late, it is good manners to wait till the congregation rises from the kneeling posture before making one’s way to a seat. It is almost an awful thing to interrupt a prayer. But I have seen people do it with no more scruple than if they were passing in a crowded street. Eighteen inches are the measurement of space allowed to each sitter in the churches. In some on the space it may be more; in others ma? occupy, it may be less. But I have reason to believe that this is the average. Now, if any man of extra size should find himself in a pew with other persons, he must, in common courtesy, keep himself as well within the limits of eighteen inches as the width of his shoulders will allow. But I have occasionally seen quite slim young men sprawl far beyond the frontier lines. Lounging is a habit of the day, and there are men who get themselves into marvellously corkscrew attitudes, in church as elsewhere. Fidgety men are more so in church than anywhere else. They seem to find it impossible to keep still. Sometimes they even produce a cough wherewith to amuse themselves, though they are not troubled with it at any other time. The charm of a reposeful manner is denied to them. Reverence for the sacred place conduces to a quiet manner; but this is not always felt by those who attend public worship. The conventional idea seems to be that such assemblies are merely phases of social life; that it is respectable to be there; and that the service and the sermon are things to be worried through in deference to a prevalent idea that they form part of an institution that is generally regarded as excellent. The small minority are those who regard church services in their true light as lifting the thoughts above earthly things, and yet by no means unfitting them for earth. Where, for instance, could a better law of good manners be found than in the Book of Books? A glance at the end of the fourth chapter of Ephesians will show a code of conduct that, if followed, would make a man a perfect member of society. Coming late, to be sure; taking up too much space on the pew; talking too loudly so other people can hear…. nothing changes! But I think your author is dreaming if she thinks that a glance into the book will show a code of conduct that would make a man a perfect member of society! I tried with my sons and their friends, but I failed. Lol! Mrs Humphrys could try.